Heh, heh...I can picture at least half of you going, "Oh, no - here come more toys with prices courtesy of L. Frank Baum." Close, but no (Monte Cristo) cigar: there are ranges in the Audio Note catalogue, the models made in Japan with tariffs which have no grounding in reality, and the UK-made stuff for Gaku-Onnabees who just can't stretch to Ferrari prices. 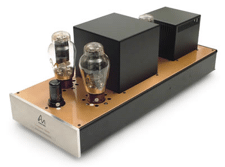 The Conquest monoblock power amps I've been playing with for a few weeks represent the upper reaches of Audio Note's British-built budget range, so they sell for a not-absurd £4400 per pair. And if the words 'budget' and 'Audio Note' seem oxymoronic, remember that the company has kits for as little as £300, and what seems like a few dozen other models below four figures. • Read more stereo amplifier reviews on HomeTheaterReview.com. • Find an AV receiver to pair with this amplifier. What's immediately apparent is the house style which differentiates between UK product and the dearer Japanese stuff. While Gaku-On, On-Gaku and the rest of the Eastern wares feature stunning construction, exquisite front panels that look like they were crafted in Schaffhausen and styling which causes palpitations in subscribers, the British cousins look like, well, crap. Plain black perspex front panels, copper top plates held by lots of exposed black screws, cheap folded-metal transformer covers -- even the Spark amplifier from China, imported yet costing half the price while bearing the same number of 300Bs as the Conquests, showed greater build-quality finesse. But this is Audio Note and the commands come from on high, so I suppose I should be grateful that I was allowed to have them in my humble home, in this lifetime, and before taking the cure.Leaving aside my fear and loathing of Audio Note practices, I bowed to protocol and showed the amps all the respect I could muster -- a tough one given that I'm sick and tired of the Audio Note fanatics out in the hi-fi community (the 1990s equivalent of Linnies) who go around bad-mouthing all other guys making S.E.T.s like Tim De Paravicini or David Chessell, acting as if everything (and only that) which issues forth from Audio Note has the desirability of a Porsche. Note that I'm talking about Audio Note's rabid supporters, not their employees. And to Audio Note's credit, I have every reason to believe that private customers are be treated like pampered reviewers. Why this sudden bout of what seems like sheer naivet ? Because I know what kind of mileage Qvortrop and David Spiers put on their cars in a year. Since it was Spiers rather than Qvortrop who delivered the Conquests, I was spared hours of audio propaganda, snide cracks about my failure to understand sound because I don't use horns or Snells, aspersions about my manhood because I own amps capable of more than 25W/channel. No tales of ten-nines silver wire, hand-rolled against the thighs of virgins in Papua, no stories about octogenarian craftsmen hand-winding the transformers, no cockeyed world view about the price of silver-versus-copper. That's because Spiers is to Qvortrop what Van Helsing was to Dracula, and his impenetrable Scottish accent betrays a sense of down-to-earth realism. Indeed, he sounds like he comes from good, bargain-hunting stock, and stopped just short of calling me 'Laddie'. His description was succinct. Read more about the Conquest on Page 2.